Minehead is a coastal town and civil parish in Somerset, England. It lies on the south bank of the Bristol Channel, 21 miles (34 km) north-west of the county town of Taunton, 12 miles (19 km) from the border with the county of Devon and in proximity of the Exmoor National Park. The parish of Minehead has a population of approximately 11,981 making it the most populous town in the West Somerset local government district, which in turn, is the worst area in the country for social mobility. This figure includes Alcombe and Woodcombe, suburban villages which have been subsumed into Minehead. Canon 511 (and later 536) of Code of Canon Law states the establishment of a Parish Council is for the fostering of pastoral activity in the parish. The basic task of such a council is to serve, at institutional level, the orderly collaboration of the faithful in the development of pastoral activity which is proper to priests. The pastoral council is thus a consultative organ in which the faithful, expressing their baptismal responsibility, can assist the parish priest, who presides at the council, by offering their advice on pastoral matters. The Pastoral Councils meet twice a year or more often if required. Pre 1888 Catholics in Minehead only heard Mass in frequently possibly only once a year. Their other option was to travel to Taunton. 1888 One of those who travelled to Taunton was Mrs Marshall who arranged for Father Matthew Gurrin OP to come to Minehead to complete his recuperation from illness. Father Matthew Gurrin stayed with Mr and Mrs Icledon friends of Mrs Marshall. Father Gurrin ministered to Catholics in Minehead for a time before being recalled by his order. 1890 to 1891 After Father Gurrin’s recall Minehead was without a Catholic priest until the Abbess of the Franciscan Convent and Mrs Icledon lobbied Bishop Clifford for a permanent mission in Minehead. In 1890 or 1891 Bishop Clifford gave Mother Abbess permission to do all she could to establish a mission in Minehead. 1891 Mother Abbess and Mrs Icledon managed to rent a small cottage with a large thatched barn in Selbourne Place Minehead. The barn was opened as a Chapel in 1891 by Bishop Clifford. Father J Davis was the parish priest. 1895 In January 1895 Father J O’Shaughnessey was appointed parish priest having been assistant priest at Taunton. He almost immediately began collecting money to build a permanent church for the parish. Accounting records exist from July 1895. April 1896 9th April 1896 the foundation stone was laid at a ceremony carried out by the then Bishop of Clifton, the Right Rev. W R Brownlow. So far no trace has been found of the foundation stone. April 1896 According to a report in The Tablet Father J O’Shaughnessey, having been on the point of leaving Minehead for Clifton resigned in favour of Father Richard Chichester, who had been secretary to Bishop Brownlow. It would appear that his appointment started about 25th April and the first entry in his hand-writing in the account book is for 29th April 1896. April to September 1896 Building work on the church was carried out by Mr W Harrison a Minehead builder. The interior decoration of the ceiling in the Sanctuary was the work Arthur Lincoln Cox a parishioner, who was possibly a member of the Cox family that owned the West Somerset Free Press. The cost of building the church was £737 which does not include fitting out etc. 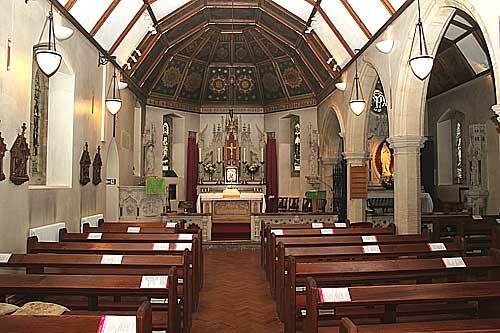 September 1896 On 15th September a service was held to open the church for divine worship. The Offertory at the opening was £31 10s 0d (approximately equivalent to £3750 in 2016). A report of the opening was published in The Tablet dated 26th September 1896. January 1898 At this time Father Chichester started to raise funds for the installation of a permanent High Altar and Reredos. The total sum raised was £157 and the cost was £154 18s 6d. Of the money raised £50 was given by Lady van Straubenzee. May to August 1900 Plans were made to add an aisle to the church. The plans were submitted to Minehead UDC and were approved on 15th May 1900. The aisle was completed by late July or early August. The aisle was formally opened on 2nd September 1900. 1901 The organ was installed which was built by Messrs Minns of Taunton. 1901 to 1907 Much if not all of the stained glass was installed. February 1914 Father Richard Chichester died on the 7th. After a Requiem Mass at Minehead his body was taken to Calverleigh in Devon for interment in his family’s plot. February 1914 Mgr J Lyons became parish priest on the 19th. He was priest in Minehead until November 1916. August 1914 World War I started. Shortly after this a number of Belgian refugees where found accommodation in Minehead and they were joined by a Belgian priest, Abbe Dupurer, in October 1914. November 1916 Father J J Noonan moved to Minehead from Clifton. March 1919 Abbe Dupurer gives a moving address thanking the people of Minehead and around for their kindness to the Belgian refugees during the war. He then returned to Belgium.